Welcome to the Creations by AR Design Team Blog Hop! This month the Creations by AR Team members are sharing creations made with the new Carrot Patch and Standing Cross Templates. Continue reading below to see how you can win your choice of one of the new templates! I'm sharing the Carrot Patch Template today, be sure to stop by next week to see what I created with the Standing Cross Template. I used the Silhouette Cameo to cut the template pieces, from Authentique pattern paper and Olive and Vanilla card stock. The "fence" template pieces were all stamped in Caramel ink using Our Daily Bread Designs Wood Background stamp. All panels are sponged with Ranger Gathered Twigs Distress Ink. To embellish, I added Dew Drops to the fence and tied Twine around the carrots. You can fill the carrots with small treats or trinkets for Easter. 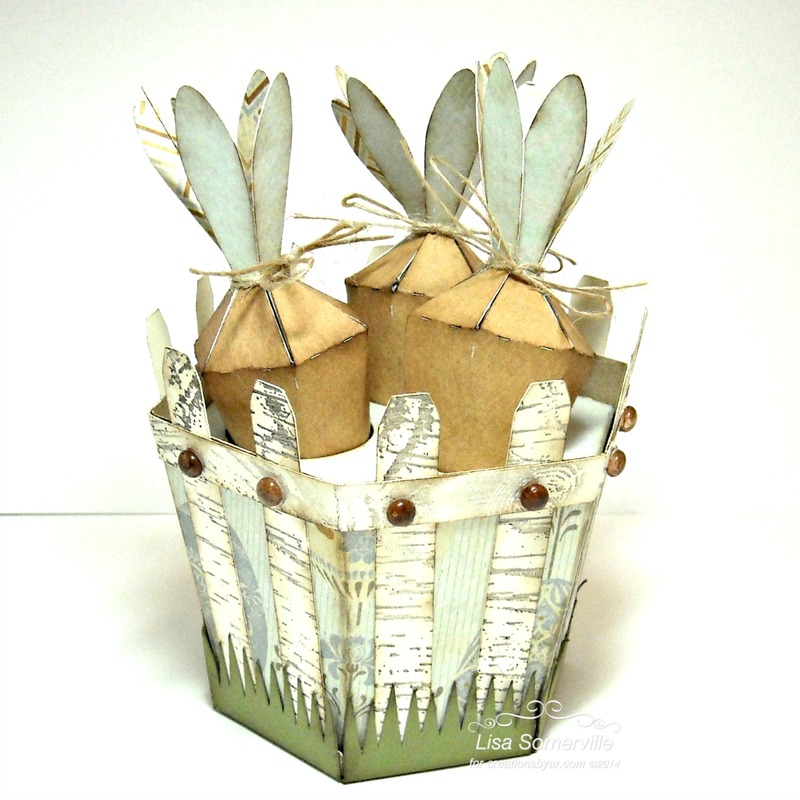 You can also remove the carrots/insert, change the grass to a base for the basket add a handle to create cute Easter Baskets! To participate and be eligible to win, simply leave a comment on each designers blog hop post by Friday, March 14, 2014, NOON EDT. Comments will also be accepted on the Creations by AR PCP Group and Facebook Page. The random winner will be announced on March 15, 2014, on the Creations by Facebook Page and Adela's Blog. Oh wow this is gorgeous!!! I love the distressed look of the aged wood!!! Love the wood grain fence and muted colors! love the woodgrain on the white Lynn! Sorry! typing too fast on my blog hop - meant to say Lisa!!! Love the old cracked paint look of the fence/basket!!! Love the realistic look to your fence - will have to dig through my stamps and see if I have a wood grain! I like the woodgrain look and and studs. Just stunning, love your style!!! Such a different look with the distressed feel. Oh my gosh is that adorable!!!!! I love this!!!! Great project Lisa. So cute! Lisa, I love the perfect vintage look of your carrot patch. Love the vintage/distressed look for your carrot patch, it really looks great! wow, love that vintage touch. YOur carrot patch lokks great. Love the papers! Great carrot patch. Beautiful job on the Carrot Patch, Lisa! Love the distressed, vintage feel that you gave it! Great job...hugs! I like the natural look to your patch. Love your papers and embellishments. Great job! Thank you for sharing! Hey-you rocked that fence with the perfect stamp-Love it! The dew drops are such a perfect touch too! Wonderful job!